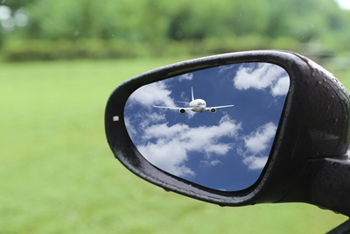 Want guidance on whether to fly or drive? Differences in vehicles, number of passengers, and individual preferences mean there is no one-size-fits-all answer. Data generally support the concern that planes pollute at inordinately high levels, making a long, energy-intensive flight for your third annual tropical vacation quite questionable, strictly speaking, from the standpoint of climate change mitigation. But for the sake of discussion, let’s say you live in Detroit and need to visit an ailing family member in Raleigh. Or you live in Phoenix and the viability of your small business hinges on attending an annual industry conference in Dallas. Do you fly or drive? There are myriad useful Web-based carbon calculators that can help you make most run-of-the-mill consumer decisions: CoolCalifornia; Nature Conservancy; ICAO, to name a few. But flying versus driving posess a very tricky example of what transportation planners call “mode choice,” a dynamic researchers are forever modeling to figure out how best to incentivize efficient and environmentally sound travel. Sure, convenience – How close is the nearest airport? – may play a big role in such a decision. But on the environmental question of trips like these, most people are operating with limited information. What’s a traveler with a long, non-optional trip to do, then, short of taking a few weeks to bike? The U.S. aviation industry produces 11 percent of total transportation-related emissions domestically, and about 2-3 percent of global carbon dioxide emissions annually are produced by planes. Most projections, including those of the Federal Aviation Administration (FAA), suggest demand for air travel will continue to increase substantially in decades ahead, with 1 billion passengers on U.S. carriers by 2029. A rising middle class around the world would lead to massive growth for global air travel. This means that, although cars and coal-fired power plants are a bigger problem, curbing emissions from aviation is a non-trivial piece of the puzzle in reducing the risks of climate change. 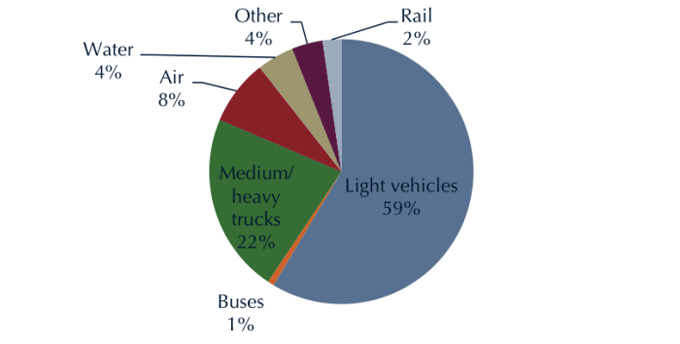 Transportation energy use by mode (source: FAA). For those concerned about managing their carbon footprints, facts and figures in three salient areas are worth knowing, though none on its own tells the whole story. First, in terms of pounds of carbon dioxide produced per gallon of fuel, there is not a huge difference between a gallon of gas for a car and a gallon of either jet fuel or aviation gas: Jet fuel produces an average of 21.1 pounds of CO2 per gallon and aviation gas 18.4, while fuel for cars is 19.6, according to the U.S. Energy Information Administration. This nominal parity in fuel-related greenhouse gas pollution, however, obscures the tremendous amount of fuel that planes use on the runway. Longer flights are more efficient overall, as cruising requires less fuel. Second, beyond carbon dioxide, emissions by airplanes have some particularly problematic aspects. The Intergovernmental Panel on Climate Change points out that aviation emissions include water vapor, which creates clouds, and releases of ample black carbon, nitrous oxide and sulphur oxide. These in turn contribute even more to a greenhouse effect and the trapping of heat. Air travel results in a lower temperature change per passenger-kilometer than car travel on the long run; the integrated radiative forcing of air travel is on short- to medium time horizons much higher than for car travel. Per passenger-hour traveled however, aviation’s climate impact is a factor 6 to 47 higher than the impact from car travel. The primary reason for this dramatic climate impact is that the contrails and clouds produced by a plane’s waste water vapor are thought to have a pronounced short-term effect on climate, but those effects are short-lived. It is worth pointing out, however, that the precise effects of contrails and clouds produced this way are not fully understood yet by scientists, and impacts may depend on aircraft altitudes. Finally, the energy intensity of flying, while still by no means green-friendly, has fallen by about a quarter over the past decade and has outpaced the declines for driving. According to recently published figures from the FAA, in 2012 the energy intensity gap was 3,193 BTU/passenger mile for driving, compared to 2,654 BTU/passenger mile for flying. Energy intensity for airplanes is “now significantly lower than automobiles.” (As noted below, these figures are the subject of some dispute). Comparison of vehicle fuel efficiency. 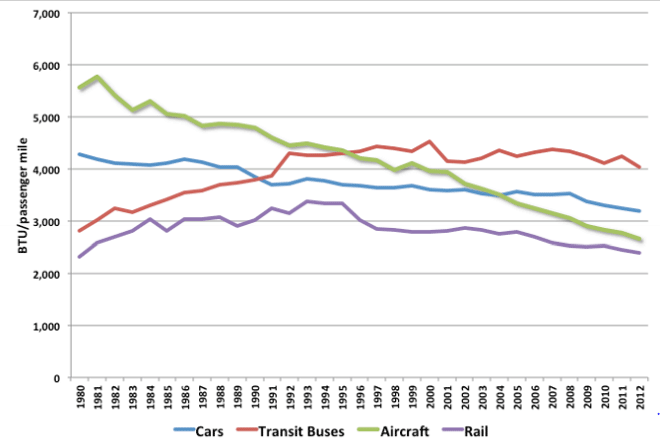 U.S. data for different transportation modes from various government agency data resources as compiled by the Oak Ridge National Laboratory Center for Transportation Analysis (source: FAA). Still, critics contend that aviation fuel efficiency gains have begun to tail off or even flatline over the past few years despite efforts such as United Airlines’s experimenting with biofuels and with energy-saving technologies such as FAA’s NextGen advanced GPS-based transportation system. Those initiatives are expected to help with flight efficiency and reduce emissions. One of the few researchers trying to make a straight, consistent comparison across the U.S transportation sector is Michael Sivak of the University of Michigan Transportation Research Institute. In working papers released over the past two years, Sivak has attempted to overturn the conventional wisdom: His main recent finding is that the average energy intensity of driving is about twice that of flying, a conclusion based on the current average on-road fuel economy of cars, pick-up trucks, SUVs, and vans (21.6 mpg). This new transportation reality also comes down to the fact, Sivak says, that cars increasingly have only the driver in them — no or few passengers. The result is that associated energy intensity and greenhouse gas emissions are very high, making air travel look like a comparatively sound alternative. Sivak notes that the current average loads for each transportation mode are 1.38 persons in vehicles and 84% of seats occupied in planes. The big emissions volume produced by air travel has, by contrast, been spread out over more and more people, as airplane occupancy rates have gone up over the past four decades. For the traveler with no choice but to go, Sivak has two pieces of advice. The first relates to the fuel economy of the vehicle: “To the extent that most families have more than one vehicle, [if you drive] take the most fuel-efficient vehicle for your trip: Drive the family car and leave the pickup truck, SUV, or van at home.” That can substantially change the calculus in flying versus driving. Since publication of Sivak’s latest findings in April, Dan Rutherford and Irene Kwan of the International Council on Clean Transportation have critiqued the analysis a bit and warned that averaging statistics across entire transportation modes and sectors may not allow for apples-to-apples comparisons between realistic scenarios in which flying and driving both may be viable options (the Detroit-to-Raleigh case, or Phoenix to Dallas). Others in the environmental community also took issue with the analysis. Still, Rutherford and Kwan concede that Sivak’s relative position has some merit. “If you are driving alone in a vehicle that gets 40 mpg or less – somewhat close to Professor Sivak’s average car trip in the U.S. including commuting, shopping, etc. – flying may be more efficient,” Rutherford and Kwan note. “If you have one or more additional passengers, driving is typically more efficient unless you are in a large vehicle.” And if you are driving a hybrid with a bunch of passengers, they contend, you are “four to five times as efficient as a plane over a similar distance.” In that scenario, they say, you even beat taking a Greyhound. In 2009, Mikhail V Chester and Arpad Horvath of the University of California, Berkeley, published an influential analysis arguing that any assessment of passenger transportation impact needs to also include infrastructure and life cycle emissions – from maintenance of roads and airports to the manufacture of planes, trains and automobiles, along with other machines and physical structures that support particular transport modes. Maintaining the nation’s roads takes massive effort and expense, with substantial associated emissions, whereas the carbon footprint of airports is comparatively small. In any case, it points to the slippery and complex nature of these sorts of comparisons. Adding the options of trains and coach buses, too, makes any mode choice between air and ground all the more complicated. But at the end of the day, all of the statistics and numbers point to an enduring reality in the twenty-first century: Getting in your hybrid with friends for a classic road trip beats a free mini-bag of peanuts or pretzels and a cramped seat squeezed between two strangers anytime.